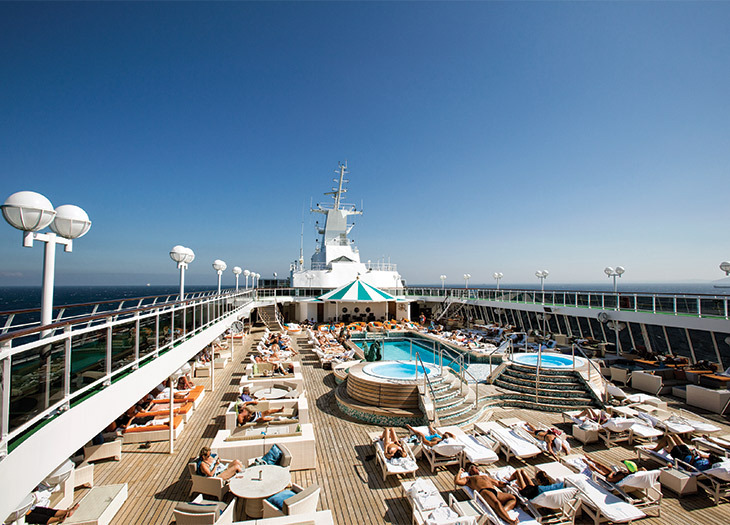 Lounging on the pool deck - an at-sea pastime. A Mediterranean sailing reveals the changing face of luxury cruising. Originally appeared in the March 2016 issue of Virtuoso Life. Maybe it was the water volleyball every afternoon at the pool. Or dancing into the wee hours at the disco. But somewhere in the Mediterranean, during a weeklong cruise on the Crystal Serenity, my husband and I realized we were getting something we hadn’t expected. Sure, we’d anticipated being impressed, based on rave reviews from Virtuoso travelers and advisors – nearly two-thirds of Crystal’s Virtuoso bookings are repeat clients. We looked forward to a week of low-key relaxation, lots of reading, and retiring early each evening. What we hadn’t planned on: having a blast. Traditionally, luxury cruising has catered to mature travelers with the money and time for lengthy itineraries. While top lines’ activities, entertainment, and amenities appealed to those core clients, they cultivated a sophisticated but sleepy reputation. Today, the same cruise lines aim to shake off those perceptions and attract a different kind of traveler: passengers with the means for upmarket cruising, but not necessarily the time for extended sailings. 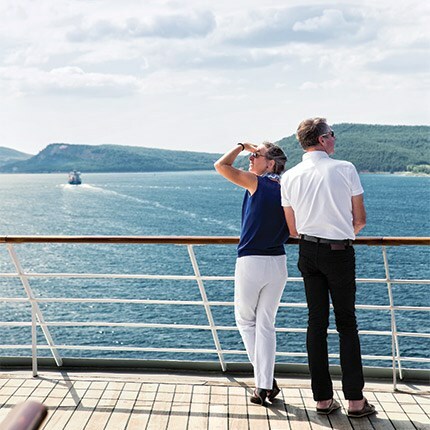 Such travelers may seek a more subdued experience than, say, the nonstop action of family-friendly megaships, but aren’t yet ready for the retirement home. When my husband and I boarded the ship in Istanbul, we surreptitiously scanned the crowd, prepared to see passengers our parents’ ages. We did see plenty of sixty- and seventysomething travelers in the well-heeled group, but we also spied couples, groups of friends, and solo travelers who seemed, well, a bit younger. Edie Rodriguez, president and CEO of Crystal Cruises, confirms that it’s more than just our perception. Other changes that entice a new type of traveler: creative itineraries in chic destinations, such as Ibiza, and more overnight stays. “And moving to an all-inclusive brand enhances the conviviality and ambience on board, so it’s more fun and social,” she notes. Rodriguez says that Crystal strives to appeal to everyone, regardless of age. “Of course, demographics vary by itinerary,” she acknowledges. Transatlantic crossings, for example, skew older. “But even more important than age is mind-set.” Sixty is the new 50? Fifty is the new 40? However you define it, cruising has something to offer every traveler. To learn about the advantages of booking a cruise through a Virtuoso advisor, connect below. Next page: Aboard the Crystal Serenity and ashore in the Mediterranean. Our first night on the ship illustrated Rodriguez’s point, and set the tone for the rest of the cruise. We headed to the lounge before dinner to mingle with a generational range of amiable guests ordering from an extensive menu of included beers, wines, and spirits. When I asked one couple what they were drinking (Aperol spritzes), the husband promptly ordered one for me – with no worry about who would pick up the bill. The social vibe extended to the main dining room, and we struck up conversations with diners at the tables around us while personable servers kept the mood festive and fun. Dinner menus include both classic and modern offerings that change nightly, from prime rib and Dover sole to charred Wagyu beef crudo and oysters with cucumber foam. Although the specialty restaurants get all the buzz – make reservations early for Silk Road’s contemporary Asian by Nobu Matsuhisa and Prego’s traditional Italian – the food in the main dining room is rave-worthy on its own. After the meal, we checked out the ship’s evening activities, which include movies, live entertainment, a casino, and numerous bars and lounges, from a cigar bar to a sing-along saloon. In the compact disco, we met a small group celebrating a fiftieth birthday and cajoling the DJ to play their favorite songs. Others soon joined us and we danced the night away. The next morning, despite ambitious plans to hit the gym, we lounged in our penthouse suite, which was decorated in sophisticated, muted tones and had a walk-in closet, a bathroom stocked with Etro products and a whirlpool tub, and clever storage nooks that maximized the 400-square-foot space. The butler (but of course) delivered breakfast and we sipped coffee on our veranda. Days at sea provide decadent swaths of leisurely nothingness, and we used the time to explore the 1,000-passenger ship. After hitting balls on the top-deck paddle tennis court, my husband joined a raucous game of water volleyball, while I settled into a poolside chaise. A few nights later at an exclusive reception for Virtuoso travelers, I met dozens of passengers who booked their cruise through a Virtuoso travel advisor to receive extra perks. Among them: 41-year-old Phoebe Crenshaw, who was on a girls’ trip with four friends. Our late-summer sailing included two stops in Turkey, sadly not on the itinerary at press time due to security concerns after terrorist attacks in 2015. Admittedly, the potential for such threats concerned us – but didn’t deter us. My reasoning: If we allow fear to dictate our lives, we’ll never go anywhere. In Istanbul, where Asia and Europe meet, we shopped the spice market, haggled for pashminas and carpets in the Grand Bazaar, sampled Turkish coffee and traditional mezes, and took in the Hagia Sophia, the Blue Mosque, and other historic sites, all with a private guide. In Kusadasi, we joined a handful of Crystal guests exploring Ephesus’ centuries-old ruins on a special evening excursion, when we had the newly designated UNESCO World Heritage site entirely to ourselves. We strolled paths once paved in marble to the Celsus Library, whose columned two-story facade served as a backdrop for an exclusive candlelit concert. White linen table cloths fluttered in the breeze, servers passed glasses of wine, and chamber music from a string quintet filled the air – an absolute “pinch me” experience I’ll never forget, and a must-do when the cruise line returns to the region. In the meantime, Crystal has replaced its Turkish stops with Greek ports such as Patmos and Hydra. Our itinerary included iconic Santorini, the dramatic volcanic island of whitewashed Cycladic buildings and blue-domed churches that cascade from clifftops toward the Aegean. The port sits about 1,000 feet below the capital of Fira, so the adventures – and decisions – begin upon arrival: Take a cable car, climb the cobblestoned path, or ride a donkey up the hillside? We opted for the cable car and headed west to the postcard-perfect village of Oia, escaping the crowds by chartering a boat for a different perspective on the island. We watched divers jump off cliffs and discovered tiny churches tucked into coves as we tooled around the lagoon, created thousands of years ago when the volcano erupted and the caldera collapsed. At a waterfront restaurant accessible only by boat or steep footpath, we lunched on a sublime meal of fresh octopus, tomato salad, and local beer and wine. Another day, another port: We beach-hopped around glamorous Mykonos, stopping for a languid lunch and serious people-watching at a beach club where bronzed revelers perfected the art of minimal tan lines. Back in the main town, wandering the labyrinth of cobblestone roads, passing chic shops, cafés, and Champagne bars, we happened upon Little Venice, a colorful collection of seafront buildings whose balconies jut over the water. Island architecture differs drastically on Rhodes, where walls of a thirteenth-century medieval fort guard the waterfront. We explored the old town on foot, while history buffs headed to Lindos to see the acropolis and others toured the island in four-by-fours. On the last night on board, we met our newfound friends for farewell cocktails. As the sun slipped into the sea and we made promises to stay in touch, I realized that the trip had changed my perceptions of cruising. Much like life, cruising is what you make of it – and I have a handful of new address-book contacts to prove it. Shorter sailings for the time-starved. These itineraries are part of the newly rebranded Virtuoso Voyages program, which affords cruisers an onboard host, private cocktail receptions, and a choice of exclusive perks, ranging from VIP excursions to a private car and driver or credit to spend on board or toward an advisor-planned tour. Connect with a travel advisor to learn more. With seven Greek port calls, Crystal Symphony’s eight-day round-trip sailing from Athens is one of the line’s only all-Greece itineraries. President and CEO Edie Rodriguez will be on board the 922-passenger ship, and Virtuoso Voyages perks include a $125 credit to spend on the ship or apply toward an advisor-planned tour. An eight-day cruise from Athens to Venice on the 450-passenger Seabourn Odyssey includes four Greek ports, plus stops in Croatia. Virtuoso Voyages benefits include either an exclusive tour and lunch in Corfu, a $175 credit for a Virtuoso tour, a $150 shipboard credit, or a private car and driver. Call on Italian and Greek ports on the 686-passenger Azamara Journey’s eight-day sailing from Rome to Athens. Virtuoso guests choose an exclusive tour of Mount Etna and a winery visit in Sicily or a $175 shipboard credit, $150 toward an advisor-planned tour, or a private car and driver. Travel to four countries – Greece, Italy, Montenegro, and Croatia – on Regent’s eight-day cruise from Athens to Venice on the 490-passenger Seven Seas Navigator. Virtuoso Voyages’ exclusive tour of Kotor and Budva includes lunch, or opt for a $175 credit toward a Virtuoso tour or a $150 shipboard credit.